Other times, smaller engines are being tested. 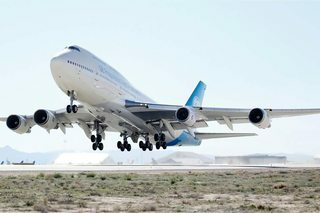 Would the smaller engine provide enough thrust for a large, heavy airplane like the 747? They only change one, because that one is a new engine that is being tested. If you are testing a new engine you change 1 at first so if it fails you have 3 others. If you change all 4 and there is a systematic defect in the design, now you have 0 good engines instead of 3. You will also see that the test engine isn't always one suitable for a 747. This is because they may be testing a new design or a new alternative fuel and it is safer to test an unknown with 3 good engines (e.g. a 747) rather than with just 1 good engine (any two-engine airplane). This increases the safety margin if the test engine fails. If the new engine is inboard, reduce the outboard engine thrust to balance the total yawing moment from that wing with the other side. Don't worry about it and trim the airplane to compensate. The other advantage to doing this on a 747 is that a 4th engine is technically not really needed as a 747 can takeoff, fly and land with only 3 operating engines. They are not testing that the engine works, that's already been proven with hundreds of hours of regulated and rigorous ground running. They are testing the "on wing" systems and behaviours in various flight conditions. The on wing systems will also have been tested in ground runs before the first flight. Therefore, only one engine is needed. Although you already have a correct answer and it is accepted too but i would add another point to the mix. They are testing a new engine which uses a new technology and is uncertified/unproven. Why should they make 4 of that version and then find out a number of things to fix and go back to all 4 of them first before moving on to produce more models? That costs a lot of money and time. Wouldn't the thrust be imbalanced? Even on our R/C Aircrafts we can have different engine RPMs for different engines (on a multi engine model), let alone a Jumbo Jet! They can all operate at different turbine speeds and different thrust levels to balance as and when needed. Not the answer you're looking for? Browse other questions tagged aerodynamics jet-engine boeing-747 flight-testing or ask your own question.